This custom figure was made by UK artist Stuart Witter. It’s based on a Kidrobot Munny Rooz figure. The Munny figure (in the shape of a rabbit) has been the basis for all kinds of amazing customs, and Kidrobot has come out with a variety of other blank figures in the shapes of different animals. The Rooz is in the basic shape of a kangaroo, but Stuart removed the head and added some sculpted elements to turn it into Jabba. 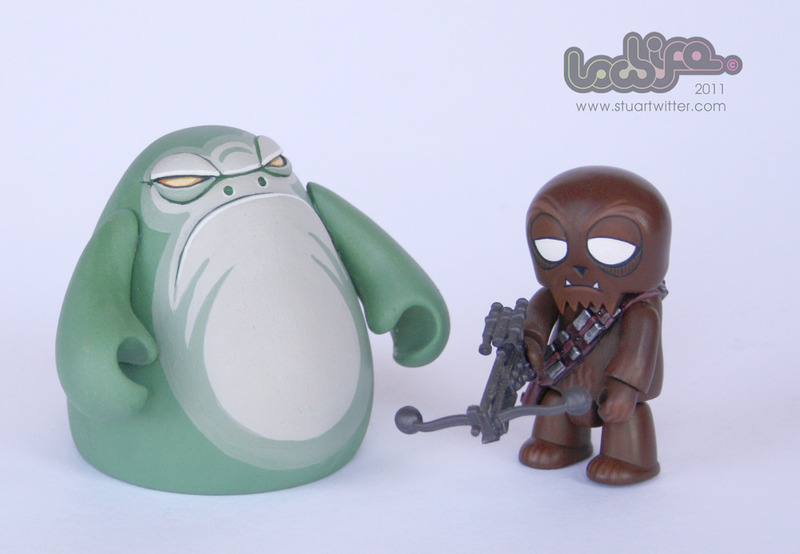 I’ve made some custom Mighty Muggs (like this Jabba the Hutt), so I know how hard it can be to create and execute a design like this, even though it may seem relatively simple. I think he did a great job of utilizing the existing shape of the Rooz figure. It’s about 2.5 inches tall. Stuart originally had Jabba paired with “Wooqee” (a Chewbacca-themed custom of a Qee figure), but I asked him if I could just buy the Jabba. Check out his Flickr feed for more of his customs (mostly non-Star Wars related, but still very cool).